Macario Hinojos Ancestors and Sibling. (2). Son Celestino Hinojos was born 19 May 1903. He was baptized in Lajitas by Father Brocardus on 17 October 1903. His godparents were Justo Alvarado and Josefa Dominguez. B. Daughter Maria de Jesus Hinojos was born in 1862. She died in Ojinaga in March 1864 and was buried at Jesus Nazareno Temple, Ojinaga on 23 March 1864. C. Son Santiago Hinojos married Eufracia Heredia 21 November 1880. They were married by Father Jose Hoban from St. Joseph’s Catholic Church in Fort Davis. Witnesses were Marcos Lujan and Victoriana Acosta. 3. Daughter Maria Cayetana Hinojos was born in 1840. She died in April 1862 and is buried at Jesus Nazareno Temple, Ojinaga, Chihuahua, Mexico. A. Son Epifanio Hinojos was baptized in Jesus Nazareno Church, Ojinaga, May 4, 1850. He married Cresencia Montoya in the same church October 2, 1894. She was born in San Isidro, Mexico in 1868, the daughter of Matias Montoya and Manuela Anaya. Epifanio and Cresencia were in Polvo, Texas in June 1895. B. Daughter Eusebia Hinojos was born in Ojinaga in 1851. She married Andres Madrid June 23, 1867 in Jesus Nazareno Church, Ojinaga. He was born in Ojinaga in 1844, the son of Leon Madrid and Josefa Cortez. (1) Daughter Maria Hinojos was born February 12, 1886 in San Carlos, Chihuahua, Mexico. She married Sixto Chavarria March 6, 1902 in Jesus Nazareno Church, Ojinaga. He was born in Fort Stockton in March 1879, the son of Severiano Chavarria and Rita Ramirez. Sixto and Maria made their home in La Coyota, about two miles west of Castolon. Sixto worked as a farmer and freighter. He died in the late 1920’s. Maria, now a widow, was living in La Coyota in 1930. By 1935 she had moved to South 7th Street in Alpine. She died January 28, 1956 and is buried in Holy Angels Cemetery. Maria and Sixto had two children. (2) Daughter Aurelia Hinojos was born in 1888 in San Carlos, Mexico. She married Lucas Acosta July 26, 1903 in Jesus Nazareno Church, Ojinaga. He was born October 18, 1883 in Fort Stockton, the son of Jose Acosta and Antonia Ramirez. At various times Aurelia and Lucas lived in Terlingua and Castolon, Texas and in Santa Elena, Chihuahua, Mexico. They had 10 children. (3) Daughter Lucia Hinojos was born December 13, 1894 in Mexico. She married Rosendo Chavarria, son of Severiano Chavarria and Rita Ramirez. He was born in La Coyota in March 1890. Rosendo and Lucia made their home in the Terlingua area until around 1930, when they moved to Fort Stockton. In Fort Stockton they owned and operated a grocery store in a room of their house. They both died in Fort Stockton, Rosendo on December 21, 1954 and Lucia on May 6, 1971. They had one known child. (4) Son Manuel Hinojos was born circa 1895 in San Carlos, Mexico. He married Demetria Morales, daughter of Tomasa Morales. They lived in the Terlingua area until at least 1925, but eventually moved to San Carlos. They had one known child. (5) Son Pedro Hinojos was born January 31, 1901 in Texas. He was baptized in Terlingua April 21, 1901 by Father Brocardus from St. Joseph’s Catholic Church in Fort Davis. His godparents were Doroteo Aranda and Maria Acosta. (6) Daughter Casimira Hinojos was born March 4, 1903 in Texas. She was baptized in Terlingua May 17. 1903 by Father Brocardus. Her godparents were Felix Aguilar and Maria Acosta. (7) Son Aniceto Hinojos was born April 17. 1910 in Texas. He was baptized in “Castolon Terlingua” by Father Brocardus. His godparents were Luis Baeza and his wife, Pomposa Dominguez. Macario Hinojos was born 3 October 1879 in Texas, the son of Vicente Hinojos and Tomasa Rivera. He grew up and went to school in Presidio, TX. On 16 May 1903 he married Severiana Alvarado in Terlingua. They were married by Father Brocardus from St. Joseph’s Catholic Church in Fort Davis. Severiana was born 14 February 1878 in Redford, TX, the daughter of Teofilo Alvarado and Josefa Dominguez. By 1904 they had settled in Lajitas. From 1908 to 1911 Macario worked for Chisos Mining Co. and probably moved his family to the Terlingua area. In 1920 they were living in the Alamito Creek area of Presidio County, where Macario worked as a laborer on a goat ranch. They apparently stayed in that area only briefly and were back in Brewster County in 1921. He probably worked in the Terlingua and Study Butte area mines in the 1930’s, but no details are available. In his later years he lived in Terlingua. Macario died in Terlingua 1 March 1968 of congestive heart failure. Severiana died in Alpine 14 December 1978 of cardiac arrest. Both are buried in the Lajitas Cemetery. Macario and Severiana had nine children: 1. Manuel, 2. Epifanio, 3. Macario, 4. Tomasa, 5. Isabel, 6. Abel, 7. Santiago, 8. Josefa, 9. Hipolito. 1. Son Manuel Hinojos was born on 1 March1904. He was baptized on 29 April 1904 in Lajitas by Father Brocardus. His godparents were Justo and Juanita Alvarado. 2. Son Epifanio Hinojos was born on 5 February 1905 in Lajitas. He was baptized on 21 April 1906 in Lajitas by Father Brocardus. His godparents were Refugio Torres and Refugia Franco. He died on 27 April 1972 in Terlingua, TX, at age 66 and was buried on 30 April 1972 in Lajitas Cemetery. 3. Son Macario Hinojos was born on 8 June 1909 in TX. He was baptized on 30 October1909 in Lajitas by Father Brocardus. He was the accused killer of Constable Felix Valenzuela in Terlingua on 19 June1938. After the killing, he fled into Mexico and was never apprehended. In Mexico he changed his name to Francisco Alvarado Dominguez, married and raised a family. He died in Mexico 27 June 1982. A. Daughter Secundina Martinez was born in Terlingua August 9, 1932. Late in life she used the name Maye. Her married name was Salgado and in September 2005 she was living in Odessa. She died in Odessa October 30, 2006. On April 3, 1943 Tomasa married Francisco Franco, Jr. They were married by Justice of the Peace R.C. Garnett. Francisco was born July 2, 1899 in Texas, the son of Francisco Franco and Juana Molinar. (For more information on the Franco family, see http://www.lifebeforetheruins.com/francisco-franco.html). 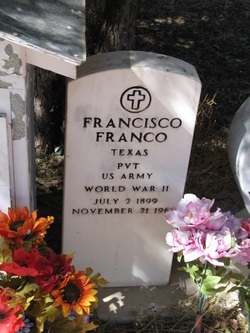 Francisco was a Private in the U.S. Army during World War II. He died November 21, 1968 in Providence Memorial Hospital, El Paso, of uremia and bladder cancer. Tomasa died in Brewster County November 3, 1978. They are buried in Holy Angels Cemetery. (1) Son Jesus Franco “Jesse” Vega was born August 22, 1964 in Brewster County. He was living in Grandfalls in September 2005. (2) Son Daniel "Danny" Franco Vega was born on 25 January 1966 in Brewster Co. In September 2005 he was living in San Antonio. (3) Son David "GIS" Franco Vega was born on 19 February 1968 in Brewster Co. He was living in Fort Worth in September 2005. (4) Daughter Angelita “Angie” Vega was born February 18, 1978 in Brewster County. She married Richard J. Portillo in Brewster County March 19, 2005. She was living in Alpine in September 2005. B. Son Jose "Joe" Franco was born on 3 April 1945 in Brewster Co. In September 2005 he was living in Alpine. C. Son Jesus "Jesse" Franco was born on 23 September1948 in Brewster Co. In September2005 he was living in Alpine. D. Son Francisco "Frank" Franco was born on 13 July 1952 in Brewster County. In September 2005 he was living in Alpine. E. Daughter Margarita "Margie" Franco was born on 14 April 1956 in Brewster County. In September 2005 she was living in Globe, AZ. Her married name Urquidez. A. Daughter Rosie Hinojos was living in San Antonio in March 1998. Her married name was Roach. B. Daughter Cruz Hinojos was living in Eagle Pass, TX in March 1998. Her married name was Martinez. C. Daughter Manuela Hinojos was living in Albuquerque, NM in March 1998. Her married name was Rodriguez. D. Son Pedro Hinojos was living in McCamey, TX in March 1998. E. Son Macario Hinojos was living in Ozona, TX in March 1998. F. Son Abel D. Hinojos was born on 8 December1945 in Terlingua. He died on 27 December1946 in Alpine and was buried in Lajitas. G. Son Merced Abel Hinojos was born on 24 September1947 in Brewster Co. He was living in Alpine in March 1998. H. Son Ramon Delgadillo Hinojos was born on 28 September1949 in Brewster Co. In March 1998 he was living in Alpine. A. Son Santiago Hinojos, Jr.
B. Daughter Ermidea H. Hinojos was born April 7, 1949 in Ector County. C. Son Ismael Hernandez Hinojos was born April 9, 1952 in Ector County. D. Son Rudolfo Hinojos was born January 13, 1957 in Ector County. E. Daughter Hilda Hinojos was born July 26, 1958 in Ector County. F. Son Hector Hinojos was born July 30, 1960 in Ector County. G. Son Osmundo Hinojos was born June 27, 1962 in Ector County. H. Daughter Norma Hinojos was born June 15, 1964 in Ector County. I. Daughter Consuelo Hinojos was born August 22, 1966 in Ector County. A. Son Rogelio Ortiz was living in Phoenix, Arizona in April 2004. B. Daughter Carmen Ortiz was living in Monahans in April 2004. Her married name is Olibas. C. Daughter Josie Ortiz was living in Monahans in April 2004. Her married name is Salcido. D. Daughter Dolores Ortiz was living in Monahans in April 2004. Her married name is Ochoa. A. Daughter Silvia Hinojos was born January 26, 1953 in Brewster County. B. Son Manuel Hinojos was born March 25, 1954 in Brewster County. C. Son Jose Luis Chacon Hinojos was born September 4, 1955 in Brewster County. D. Son Oscar Chacon Hinojos was born January 13, 1958 in Odessa. E. Son Ernesto C. Hinojos was born May 29, 1958 in Odessa. F. Son Jesus Hinojos was born May 21, 1962 in Odessa. G. Daughter Guadalupe Hinojos was born June 14, 1964 in Odessa. H. Son Sammy Hinojos was born February 5, 1967 in Odessa. I. Daughter Dialva Hinojos was born September 19, 1973 in Odessa. - Baptism and marriage records from Jesus Nazareno Temple in Ojinaga, accessed using the FamilySearch web site. - Baptism records from St. Joseph’s Catholic Church in Fort Davis, copies held by the Archives of the Big Bend, Sul Ross State University, Alpine, Texas. - Brewster and El Paso County death records. - Abel Alvarado Hinojos obituary, Alpine Avalanche, 2 April 1998. - Clifford Casey papers, Archives of the Big Bend, Sul Ross State University, Alpine, Texas. - Josefa Hinojos Ortiz obituary, Alpine Avalanche, 8 April 2004. - Cemetery markers in the Lajitas Cemetery, observed by the author.